Okay. To be fair, she didn’t really cry… but she did choke up a bit! I wonder if these celebrities know how much we mere mortals suffer for them. Examine yourself. You know what lengths you’ve gone to for a celebrity, whether it’s been making a choice between whether to eat or buy their latest album or sitting outside in the rain only for them to perform one song and leave the stage. Me, I wore stockings. I was slow to get on the Chimamanda bandwagon, but she’s won me over quickly and earnestly. I picked up a copy of her first book That Thing Around Your Neck the night before the reading with hopes that she would sign it; and sign it she did! 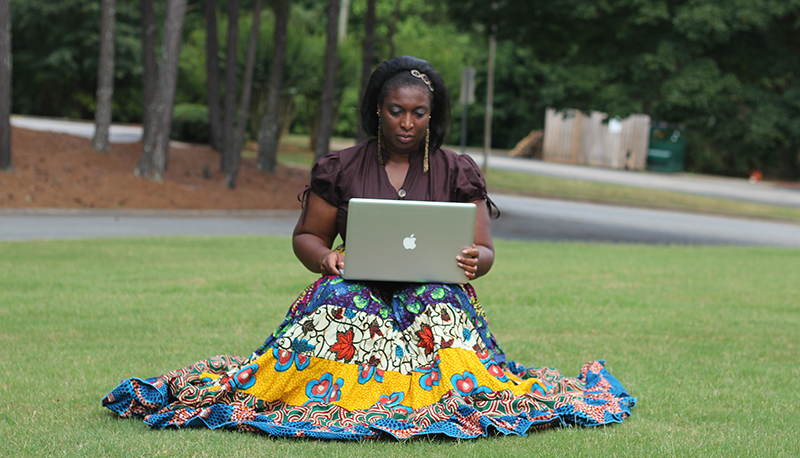 Chimamanda had come to Atlanta to read from Americanah, her latest work. The woman is a wonder. Physically, she is not what I envisioned, even though I’ve seen her a dozen times on TV or YouTube. She’s tiny, very slim. Her eyes really are that brown. And her hair…my Lord! Was I really in danger of being star struck? It would appear so. After she read a few pages from the first chapter, she opened to floor for questions and dialog. 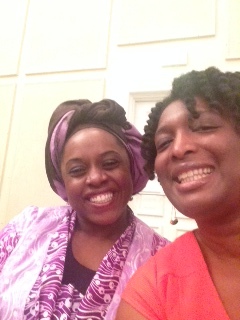 I have never been one brave enough to ask questions of guest speakers, but for Ms. Adichie it was different. There was something I had dreamt of saying to her face if I ever got the opportunity, and only Heaven knew when I would have this chance again. Chimamanda, like India.Arie, gives very special thought and consideration to all her responses. Though I was only fourth in line to ask my question, I waited 20 minutes to get to the mic. She is that detailed in her answers, which the audience thoroughly loved. She witty, contemplative, and just a tad snarky when necessary. When it was my turn, she smiled and we made eye contact. I began slowly, since I have always been accused of speaking too quickly. Chimamanda smiled with pleasant recognition and ahhh’d into her mic. We locked eyes for a moment, and I scurried away (Lumbered, really. My heels were SO uncomfortable), very aware that she had not made an addendum to my comment. When I got back to my seat, Tosinger (who was my date) told me that Chimamanda had gotten choked up. I was appalled. The night progressed superbly after that. She never got a chance to read anything further because the line for questions and comments was steadily getting longer. Each of us had a tale of thanks and appreciation to tell, and Chimamanda in return offered this observation after one particularly stunning woman from the Carribean approached the mic. Of course, we all clapped wildly. We even got to see a different side of Chimamanda when her friend Chika asked a question. She promptly told Chika to sit down, which prompted Chika to “waka” her. Tosinger and not less than 12 other Nigerian women were livid. Apparently, the hand gesture she offered Chimamanda was one of high insult, and basically tantamount to the middle finger. Hei! The line showed no sign of getting shorter as more and more people summoned the courage to ask a question concerning her work and her process as a writer. The organizers cut it short only after giving an 8 year old boy a chance to ask his question. He stepped away from the microphone and heaved for air. 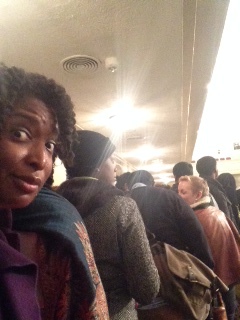 I stood in line for an hour – in heels and stockings – to wait to have book(s) signed. Chimamanda was amazing. Her smile never faded, and she greeted each person with the familiarity of a dear friend. It made up for the behavior of one of the event organizers, whose blacked eyes and nasty attitude compelled me to swear to NEVER donate to their literacy cause. Ugh, he was awful! The line got shorter and shorter, as did the distance between my knees and the top of my stockings. 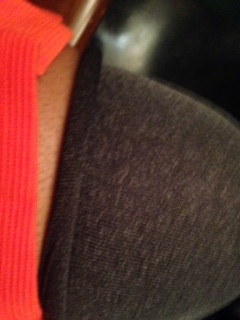 The combination of ill fit, my size and standing for so long was causing them to roll down my hips. I tried to keep it together as I approached her signing table with a beating heart and a barrage of very African demands. “Hello again,” she said saccharinely. She nodded, but looked confused as she tried to recollect. I didn’t have time for that. I had a list to finish! Chimamanda broke into a fit of laughter and then offered me her hand in a very queenly fashion. I took it and touched my nose to it. Her hands are very soft. My nose was very sweaty. “And would YOU sign a copy of MY book?” I said quickly. My stocking, by then descended to thigh length! And then I skipped away and went to try to roll up my stockings behind a vacant church pew. Tosinger also gave Chimamanda a gift of her latest CD. She accepted our tributes graciously. Oh, MOM Squad. My heart was so full last night! My back, feet and ankles were killing me for the strain I had put on them, but there was a ridiculous smile plastered on my face, which I would have worn to bed had I not walked into the house and found a cockroach struggling for life on the floor. It flopped and wiggled so insistently. I hate roaches! I picked up a broom, beat it violently, beat it some more and then swept it outside before going to bed to bask in the glory of meeting Chimamanda Ngozi Adichie for the first time. I had violently and viciously murdered our family pet.